When you are at the end of your wits, think about us. We are here to help with the problems you face each and every day. 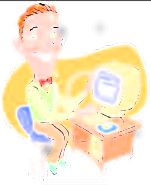 Our site is here to give comfort and knowledge to the users of computers. Support and system design is what we do best. Just look us over and feel free to ask questions and give us your comments. If your need is training then you have come to the correct place. We have been working in the computer industry in one form or another since 1985 doing industrial computers to home computers, if you want a reference just contact us. As this site grows I am sure you will find many tools to make your computing experience less of a problem and more something you look forward to.